It's taken me quite a bit of recipe testing to come up with a recipe for waffles that I think is practically perfect. 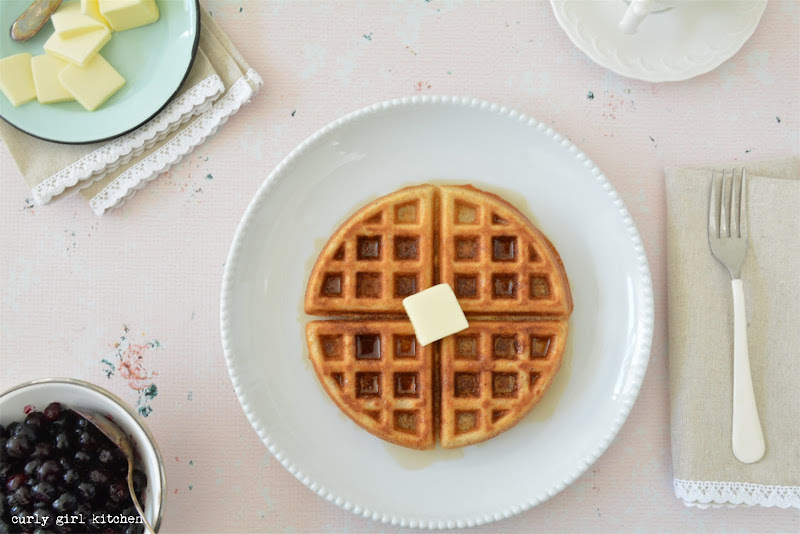 Over the years, I've served my husband far too many soft, limp waffles that were essentially just waffle-shaped pancakes, and he ate them without complaint, but I knew they were all wrong. Now, I love a stack of light, fluffy pancakes drenched in pure maple syrup, but not when what I want is a waffle that's golden and crisp on the outside and fluffy inside.. 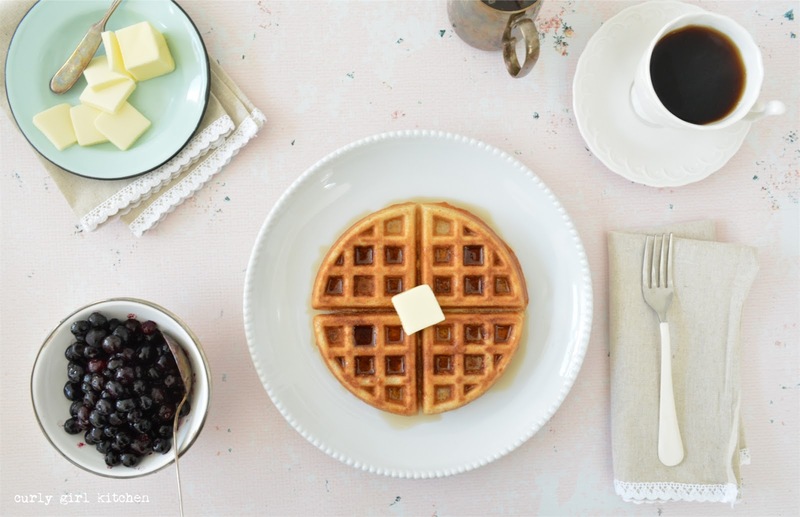 Using an expensive waffle iron is not necessarily all that important. Last year for my birthday, I had a craving for chicken and waffles for dinner. The fried chicken was nearly done, and I plugged in the waffle iron to heat up while I mixed up waffle batter when I noticed that the waffle iron wasn't getting hot. It wasn't even a little bit warm. For no apparent reason, it had simply stopped working, and drop-kicking it on the patio didn't fix it, either, so while I continued working on dinner, my husband ran out to buy a waffle iron. Our grocery store is five minutes from our house, and carries small kitchen electronics, so pretty soon, he was home with a cheap waffle iron that would hopefully do the trick for our dinner. And while I wouldn't mind a nicer one that locks into place so the batter doesn't drip out the sides, it cooks the batter well and has been just fine for our once or twice a month use. 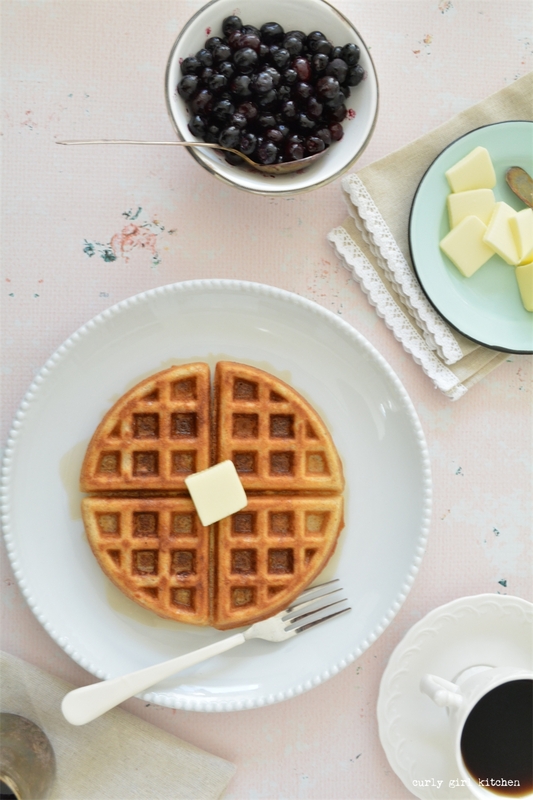 One of the first steps to achieving crispy waffles is to use enough melted butter in your waffle batter. 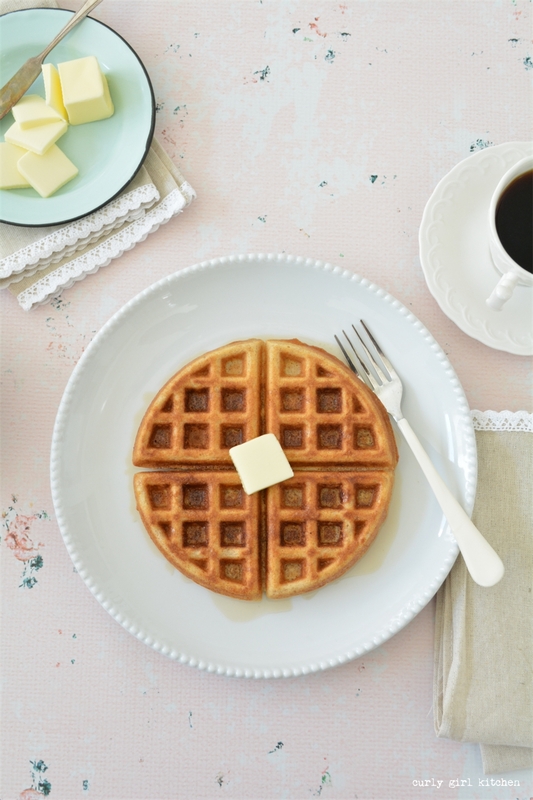 The fat is what makes it crisp, and if you shy away from it, then you won't get a crisp waffle. Some people use shortening instead of butter, which I'm sure works wonderfully, however, just like in my pie crust, I prefer to use all butter instead of shortening. The next thing, which is not as obvious as it might seem, is simply cooking them for long enough and ignoring the "done" indicator on the waffle iron. When the little light turns green on my waffle iron indicating that they're done, they're not nearly ready. And if I were to take them out right then, they'd be cooked through, but soft as pancakes. So I leave them in, checking them every few minutes until they're a beautiful golden color and crisp to the touch, which takes anywhere between 4-7 minutes, depending on your waffle iron. I've also experimented with using a mixture of half wheat flour and half white flour; the wheat flour adds a heartiness to the waffles that can be nice, but personally, I've come to prefer the texture with only white (all-purpose) flour. Milk can be used instead of the buttermilk, but the buttermilk adds a really lovely, tangy flavor that only buttermilk can do. And one of the best things about cooking a big batch of waffles is freezing the extras and toasting them for breakfast the next day. Serve with butter, jam, maple syrup, and/or fruit.